How can I help Jim Johnson break his bad streak for the Oakland A’s? I used the Force! My solution is Star Wars related. Chris Sale, Alfredo Simon, Joe Mauer, Hanley Ramirez, David Murphy, Alex Wood, James Shields and Brandon Belt all added to their totals for Who Owns Baseball. 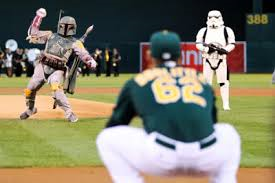 This entry was posted in bullpen closer, Sully Baseball Daily Podcast and tagged Darth Vader, Jim Johnson, Oakland A's, Oakland Athletics, Paul francis sullivan, Sean Doolittle, Sonny Gray, Star Wars, Sully Baseball Podcast. Bookmark the permalink.